for others' eyes to see. ready to read and rise." Muma scolds me with her eyes. "Schooling costs money we do not have," she says. is useless to you, Amira. I do not like hearing this. I do not like what I know Muma will say next. you will not need to read. A good wife lets her husband do the reading." Their peaceful farm life implodes when her father is killed in an attack by the Janjaweed. Amira, her Muma, her sister Leila and their old friend Anwar must leave their home for a refugee shelter, where there is little space and much hunger. The loss of her father has lasting effects on the small family left behind; their grief is captured eloquently by the author. Amira is rendered mute by the horrors of the death and destruction. Ms. Pinkney does not avoid the harsh realities of lives changed forever. The days are long. Anwar spends endless time with Amira teaching her to read and write. 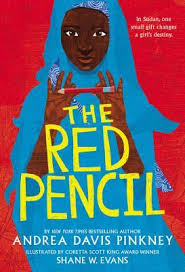 When an aide worker gifts her a red pencil and a yellow notepad, Amira begins the long healing process that results in an even stronger desire to follow her heart. Shane Evans adds a subtle layer of understanding with his effective line drawings. His art carefully matches the story as it shifts from the early days of happy play to the drama that becomes their life, when the family is first attacked and then must move to the crowded camp. This is a powerful and terrifying story, achingly beautiful in the telling. Using free verse to share the shocking reality of what life is like for so many in war-torn countries, Ms. Pinkney is astute in her observations and hopeful in establishing the resilience of a young woman in the face of such adversity. Back matter includes a note from the author explaining how knowledge of the Darfur conflict and the resulting human casualties led to her write the story of the many children affected, using a singular voice to make it more personal. A glossary and pronunciation guide, and a list of important terms are added. "My life with Ivan Ivanych? First class. We fight, yes, on occasion, but I let him win every time. He wants me to wash up in the morning? No problem. Brush my teeth, top and bottom? I do it. I don't spit on the floor. I don't cuss. In return, three square meals a day with extra helpings." "I'm a risk taker. That's why I score like crazy. I score on the go, with the ball in the air, with my back to the goal. I score in all weather. Dirt, mud, or ice, I score." "Children of the enemies of the people!" Butterball booms through the bullhorn. "Do not forget what our humane government has done for you. The government has put a roof over your heads, has given you food, shoes, and medicine. It has given you free education. But what did your parents do? They were accused of crimes against our people. They were punished and left you orphans. Remember, children, you are better off without such parents. When the government inspectors visit us today, show your loyalty and gratitude. No wisecracks. No monkey business. Questions?" As entertainment for said inspectors, Butterball bribes Arcady to play in a series of contests against older, stronger boys. The inspectors leave, satisfied that things as are they should be at the orphanage. Imagine then the surprise, when one of the inspectors returns shortly after to arrange to adopt the young athlete. Will his life be easier? Leaving the orphanage with Ivan Ivanych, Arcady does not know what to expect. Russia, under Stalin's rule, was a terrible place. Arcady's 'prison' is evidence of that. Should he feel shame at his parents' fate for daring to speak out? He faces pain and hunger every day at the hands of Butterball and the orphans who share his fate. The conditions are brutal, and never improve. Soccer is his saving grace, and it is what makes Ivan notice him. 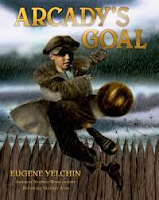 Can Ivan help to make Arcady's dream of playing for the Russian national team a reality? "I'll tell you anyway," he says, grinning. "When these grown men chased after their sons around the soccer field, I had a feeling I didn't expect. Envy maybe. I envied them having fun together. Having fun is normal, right? I thought why couldn't Arcady and I have fun? Enjoy a normal life together. Can you understand that?" While they cannot escape the events that have brought them to where they are, they might just be able to form a new family in the face of tremendous odds. In doing so, they provide readers with a clear look at the lasting impact of a totalitarian state where no one was really safe. We also realize that despite the many atrocities, there can be hope when there is love. "Mrs. Poodle thought so, too. 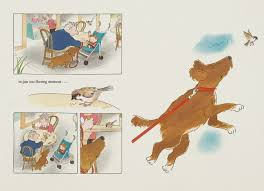 You know how much young children loves books about animals...and their enduring admiration for dogs! Gaston is a puppy to love, and not just because he's a French Bulldog. I will readily admit I am partial to Frenchies! Gaston is a member of Mrs. Poodle's litter of new puppies. They are 'precious.' Although treated with the same attention and love that any mother could possibly give, Gaston displays a marked difference in size, manners, and temperament to his siblings. He is louder, more gregarious and a real delight. And, he is adored by his family! What will happen when they get home? You might be surprised! 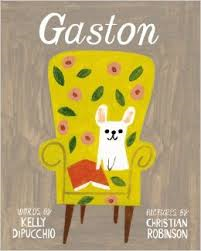 Kelly DiPucchio hits all the right notes with her witty and winning text, while Christian Robinson adds delight when depicting the two families in bold, textured acrylic images. There is lots of energy in both aspects of the tale, and shows that a spot-on collaboration can make for a fun-filled and lighthearted reading experience. Encore! could do anything at all." As soon as I read this book, I put it in my book cart for mailing to my son-in-law and new granddaughter. It is a perfect daddy-daughter share! Penelope is not pleased with the rain; it just seems to go on and on! She is so B-O-R-E-D! Dad is busy with coffee (or tea) and a book; he seems content. Being the wonderful dad that he is, he is quick to respond with the 'druthers' question. After explaining what he means, he delights in spending the day with his daughter doing all those things she would 'druther' be doing. using every conceivable toy and plaything in their repertoire. I remember those days at our house when imaginations ran wild, and rainy days were totally forgotten. When the fun appears to be coming to an end, Penelope has only one wish for tomorrow! Dad is filled with all of the energy needed to help create the world conjured up by his young daughter's dreamy wishes. He is also patient and understanding of her disappointment in the seemingly endless rain that keeps her from outdoor play. Together, they have a truly remarkable day. Using ink and watercolor, Matt Phelan illuminates the pages with warm color, soft and gentle lines, and enough detail to keep even the most observant child busy trying to take it all in. When all is said and done, I'll bet both parties are just too tired to 'clean up'! I also remember that scenario. will never have a sister." 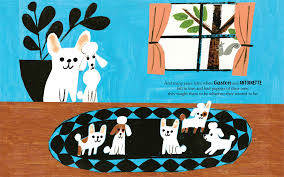 I am thrilled to spend time with Loula in her second book about life with Gilbert, her intrepid chauffeur and friend. If you met her, as I did, in Loula Is Leaving for Africa, you cannot help but feel sympathetic. She has well-meaning but self-indulgent parents; rotten, highly annoying triplet brothers who make her wish for nothing more than 'a sister just like me'; and Gilbert who loves her unconditionally and does whatever it takes to make her happy. stomach ... and ... and..."
supper, kisses and hugs ..."
"Is that all?" asks Loula. "And chocolate!" adds her father, chuckling." Armed with every bit of information she needs, and filled with ideas of her own, Loula is off to make that sister she so desperately wants. Gilbert, always up for a challenge, is right there with her every step of the way. 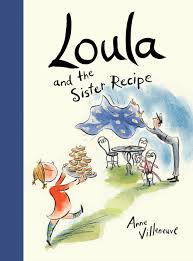 It is no surprise that they succeed in their quest to fulfill Loula's most ardent wish, albeit in a sharp and surprising way! Using ink and watercolor, Ms. Villeneuve recreates Loula's world with energetic lines and lots of white space, allowing her young audience to track Loula in her search for that new sister. Spot pictures allow us to keep up with all of the action, and to appreciate the many indulgences Gilbert provides for his young charge. The closing series of panels, showing Loula's joy at having the 'sister' she so desperately wanted, are both hilarious and heartwarming. died. Didn't God look downstairs? check out. But he picks a kid." The death of older brother Noah leaves Walker and his mother reeling in their grief. Everything reminds them of him, and their love for him. It is the stuff of anger, and nightmares, and ongoing conflict. two whole months, and she's still crying." "Are you kidding me?" he gasped. "You prayed," said Jesus. " I showed up. but traffic on I-55 was awful." It is a comforting meeting for the two, and filled with the humor that will be a part of their daily conversations. It is through his relationship with the Jesus only he and a few others can see that Walker begins to heal. Jesus has important lessons to teach about the power of faith, and the ways in which we must learn to help ourselves. 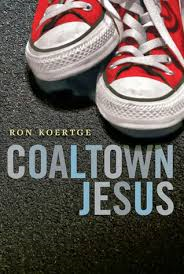 The dialogue is whip-smart, the writing is thoughtful and thought-provoking as you would expect from any book that has Jesus at its heart, and that is written by the accomplished Ron Koertge. was coming down the pike, so I'd practice. "In the Bible, you just walked." so I wouldn't sink so fast. Didn't help. at it, so I wasn't that good at first." His mom is not the only one who needs help to assuage the grief. "Jesus moved closer. "Walker, listen to me, okay? the light never goes out." It is a very quick read. Once started, you will not be able to put it down. That is its charm. I have read it a few times, and I am sure that I will read it again. It is wise, emotional, humorous and most of all, unforgettable. There are those who will not like its seeming irreverence. Read it or not, it's up to you! "One day Albie's father gave him a mariner's compass, and before his family's eyes, Albie took it apart and put it back together again. Another time, Albie built a house of cards so high that it looked just like one of Munich's towering cathedrals. When his parents asked in amazement, "How did you do that?" he only smiled." 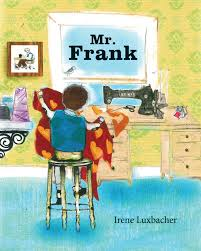 It makes him all the more engaging to those learning about him in this excellent and invented picture book biography. His concerned parents took him to the doctor who made the suggestion that taking Albie places like the symphony would encourage questions and comments. It was evident that he embraced the excursions with joy and appreciation. They did not produce one word. "When the lecture ended, all the students politely clapped. Albie jumped up and down. Albie squeezed his father's hand with happiness. But he didn't say a word." as a single word in his entire life, they would love him just as he was." 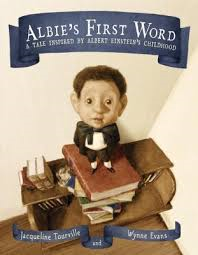 To his mother's surprise, it was the very day Albie spoke his first word. I don't think you will be too surprised at what that word was. I appreciate the artwork created in oil glaze and then finished digitally, as it gives readers a close look at the life of a German well-to-do family in the late 1800s. The variety in perspective, the muted palette, the detailed backgrounds, and the endearing, expressive face of Albie ensure a careful look at all that is happening. The clever ending, the excellent author's note, the glossary of German words spoken, and the reproduced endpapers of Einstein's work add much appreciated context. "Our house, built in the 1950s, has a mysterious little room we've always jokingly called "the bomb shelter." Given its location in the basement, it was probably built as a root cellar. When I started learning to make cheese, I read about how the best cheese makers use caves for aging wheels of cheese before they are ready to eat." I promised I would tell you about this newest addition to the exceptional Orca Footprints series. Take Shelter takes a look at the history of housing for people around our world. Those homes are detailed in brightly colored photographs and accompanying text that is accessible and highly informative. The authors have created four parts to their study of shelter: In The Ground, On The Move, Houses That Live and Breathe, and Innovation. In each, they offer a detailed look at the way people live in their homes, wherever they might be. The Tate family moved a lot. Dani Tate-Stratton tells her readers: 'by the time I was in high school I had lived in more than fifty places, from a high-rise apartment in a big city to a tiny cabin in the mountains.' That makes my living in seven homes in 66 years pale in comparison, doesn't it? "HOME FACT: Each year, 35 million people are forced to flee their homes because of war, famine, drought or other conflict. Many of these refugees will be forced to seek shelter in a camp or temporary dwelling." If you want to talk with your children and students about the many ways that people of the world find shelter, and do it in an informed and appealing way, you would do well to share this book with them. Then, let them take it and find their favorite parts to read on their own. They will find it endlessly interesting, and full of surprises. Many of us don't take the time to think seriously about the way that people beyond our narrow perspective make a home. This well-researched and clearly written book may just change that! It is quite amazing to see the creative and original ways that people find to make a 'home', no matter the circumstance or the setting. Adaptation is a pretty amazing thing, isn't it? "When I was living in Iceland, I noticed that energy-efficient homes and buildings used readily available geothermal power as a heat source. In major cities like Reykjavik, the sidewalks are heated with hot water running beneath them. That means fewer people slip and get injured while walking on icy pathways...."
Put this terrific book on your list; then get a copy from your local book store, or public library. You will be better informed for having read it. She had a little browse. She bought a frilly blouse. CLICK! A hive of bees." 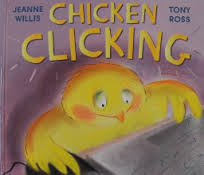 This is a picture book that offers a caution against overuse of the Internet to feed a shopping habit, and about finding friends online when you don't really know who they might be. Is it an important story to share? You bet, it is! her attention is drawn to a number of tempting purchases. CLICK...and they are on their way to the farm. When the goods start arriving, the farmer is bamboozled. He has no recollection of their purchase. A second foray brings a host of goodies for the chick herself. The farmer is furious and blames his wife. Knowing she is innocent, the wife blames the computer. She gave her name and age. Happy, convivial chats lead to a planned meeting. Chick tells no one. Young children will quickly get the message when they see who that friend really is! sure to inspire a discussion that needs to be had. for the materials to build it." I loved to ride the Ferris wheel when I was young. Every July, when the fair came to town, my friend and I would race over to the fairgrounds, and spend all the money we had saved throughout the year in one fun week. I never wondered who had designed the first one. 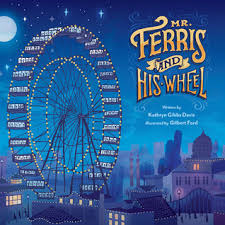 I wasn't even aware that it was deserving of a capital F.
Now, our Ferris wheel was pretty low-key until the year we got a double one! Still, they had nothing on the Ferris wheel constructed for the 1893 Chicago World's Fair. 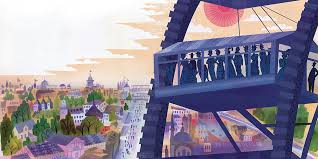 It all happened as a result of what had been unveiled in Paris in 1889 - the Eiffel Tower. Not wanting to be outdone by the French, a nationwide design contest was announced for engineering feats that would be even more spectacular than Paris' tower. "George blew the golden whistle. chain drove the mighty machine. above the mud and noise." It was a successful ride, and soon became the best fifty cents people could spend when they visited the Chicago World's Fair. More than a million and a half people rode it while it operated. It did exactly what George Ferris had dreamed it would do! It made its final trip on October 26, 1893...the precursor to those rides still enjoyed by many today around the world. Readers will very much enjoy this well told story. Sidebars add relevance. The artwork is done in digital mixed media using ink and watercolor, and bring readers to a time and place very different from today. Quote sources, a bibliography, and a list of websites will add interest for those wanting to know more than Ms. Davis and Mr. Ford have provided in this welcome and wonderful piece of historical fiction. Quite the accomplishment; then for George Ferris and his team, and now for this fine collaborative literary team! where it will be safe and dry. it," Red Knit Cap Girl says. "That's what I wanted to show you all,"
Squirrel says. "It's called a nook." And a perfect little place it is. It's just right to keep Red Knit Cap Girl's book dry. If the book is dry, everyone can read it. Soon, the other animals add their contributions to the nook. The birds bring a newspaper. Beaver, the builder, constructs a shelf. It isn't long until others are helping out. a solution. Warm wool blankets are sure to keep readers warm and snug. But, winter will soon be here. Owl and Moon have been watching. Now, they have a contribution to make. Naoko Stoop's soft and charming illustrations are created using acrylic paint, ink and pencil on plywood. They provide a feeling of warmth, no matter time of day or season of the year. 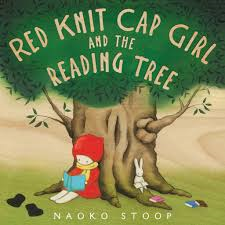 There is a lot for readers to talk about as they share this welcome addition to the series of stories about Red Knit Cap Girl and her friends. This would be a perfect book to find in a Free Wee Library. After all, 'It is good to share books.' Don't you agree? "I was old enough to go. was working fine for me. was what I was taught." I have mentioned in previous posts that I was astonished with the learning I did this summer and fall, thanks to the publication of a number of books about the civil rights movement. In their new book, J. Patrick Lewis and George Ella Lyon (poets extraordinaire), give voice to some of those people who may have been present at the March on Washington on August 28, 1963. 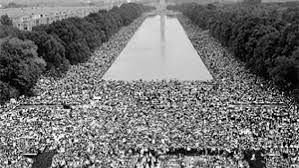 A pivotal event in the history of civil rights in the United States, it drew hundreds of thousands of people to march for jobs and freedom. Martin Luther King Jr. made his 'I Have a Dream' speech and shared the program with other civil rights leaders and artists. The March played a huge role in making the Civil Rights Act and the Voting Rights Act realities in following years. Here, the poets use mostly first-person 'voices' to share the spirit of those who were there. There are 70 poems, in voices young and old. They represent the myriad of attendees who marched together for a better life, a better home, a better country. They are compelling and worthy of your attention. in windows on Georgia Avenue. Included in back matter are an authors' note as guide to the voices, a list of historical voices, other notables whose names appear in the book, imagined voices, a bibliography, relevant websites, further reading and an index by title, and then by voice. I look at our food. I wonder if we have enough supplies for a power outage that lasts two days, four days, a week. I wonder what will happen if a tree falls on our house." There is so much to love about Rose. She has some very special loves herself: she loves homonyms, her dog Rain, prime numbers, rules, her Uncle Weldon. But, her life is also fraught with difficulties, not the least of which is her father. Her father works during the day, and spends his evenings drinking at a nearby bar. One night, he finds a dog alone in the rain and brings him home. He gives the dog to his daughter and allows Rose to choose a name. Rain (found in the rain) keeps Rose company when she is alone. Rose collects homonyms daily, and adds them to her continually changing list. If she runs out of space on the alphabetical list, she starts the list all over again, in order to include the new set of words. 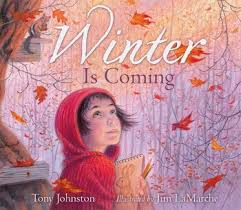 When Rain's father loses patience with her, as he often does, she turns to Rain for comfort, and to her Uncle Weldon who takes her to and from school each day, helps her gather homonyms, and calms her when her father frightens her. A coming storm is disconcerting for Rose as the weather forecasters are predicting big problems. She and her father prepare as best they can. They cannot prepare for Rain's disappearance, and Rose is very upset with her father's actions. He is the one who let Rain out during the storm, and didn't think to let he back in. Now, Rain is gone and they have no way of looking for her because they are stranded in their yard by swirling, high waters. "The power is out everywhere. Millions of people are in the dark. Millions. It could take weeks to restore it. And your school won't open until the power is back. But I need my routine. Most of all I need Rain." Without her father's help, Rose thinks up a plan for finding Rain. She makes a list of all the animal shelters that are close by, and phones them to see if they have seen her dog. Rain is not at any of them. Uncle Weldon helps when they can finally get off their property. Eventually, using Rose's well-devised plan, they do find Rain. There, they make a heartbreaking discovery. The news leads Rose to take matters into her own hands, and do what a girl consumed by rules knows is the right thing. What a voice Ms. Martin has created for the forever memorable Rose! She speaks clearly and honestly about her day-to-day life, its challenges and its joys. Her writing is full of wit, angst and understanding. Despite Rose's preoccupations, she shows awareness and integrity when dealing the one momentous decision she feels compelled to make. "I think about the homonyms soared and sword. They're an interesting pair, because soared is a very nice word, especially when you imagine musical notes swooshing through the evening air, but sword indicates weaponry, so that isn't a nice word at all. That's one of the many things I like about homonyms. Most of them seem unrelated, some seem to be opposites, like soared and sword, but a few make lovely connections if you're open to changing your perspective when you think about them." 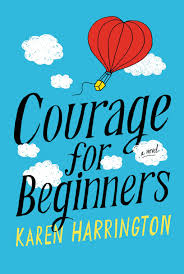 Emotional and honest, this book is about autism, yes. It is also about family, love, and hope. 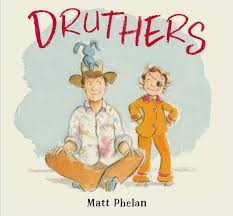 It is a book that deserves to be on the Newbery list for 2014. Don't miss it! "And finally, Leroy spoke. He opened his mouth and said the sweetest words he could think of. He said, "You are the most beautified horse in the whole wide green world." The horse pricked up her ears. She twitched the left ear to the right and the right ear to the left. Both ears quivered hopefully. 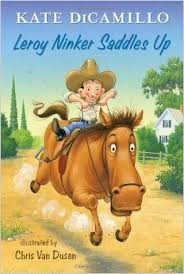 Emboldened, Leroy Ninker leaned forward and spoke directly into the right ear." Lucky we are that Kate DiCamillo is a pretty prolific and astonishingly accomplished writer! She has written some of my very favorite books...many hold pride of place on my 'keeper' shelf. They are books I have gone back to read again, and that I will surely read to my granddaughter in the future. "The cowboys wore ten-gallon hats. They wore boots. They carried lassos. The cowboys were men who cast long shadows and knew how to fight injustice. They were men who were never, ever afraid." 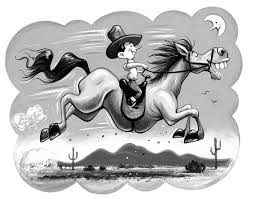 It is only when his friend Beatrice mentions it that Leroy realizes he is missing one essential component of a cowboy's staples. He needs a horse, and Beatrice has the solution to his problem. She reads an ad from the newspaper, and Leroy is off! Once he sets eyes on Maybelline, he knows that he has met a soul mate. Her owner does offer advice: Maybelline is a horse who 'enjoys the heck out of a compliment', who 'eats A. Lot. Of. Grub', and who 'gets lonesome quick.' She is adamant that Leroy remember these things. I bet you know what's coming! has the situation in hand. He does everything he can do to assure his companion's contentment. When a problem does arise, Maybelline does what she does when lonely ... she runs. It's up to Leroy to find her. If you know Mercy Watson, you may remember meeting Leroy in one of her popular adventures, It will then be no real surprise to learn that Maybelline is attracted to a smell that leads her to Deckawoo Drive, and eventually to Mrs. Watson and her pleasant nature and her welcome home kitchen. How lucky are these friends to have each other! story of an aspiring cowpoke and his constant companion. Yippee-yee-hah! If you spend any time at all with small children you will know just how much they love books that encourage them to take part in the conversation. 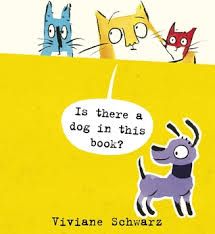 Viviane Schwartz uses that knowledge to craft yet another book about Tiny, Moonpie, and Andre, three cats who get their audiences totally involved in the tales they tell! They beg their audience to help. They must hide! As they hide in a variety of spots, we can see that the dog seems totally unconcerned with finding them. He is much more interested in exploration. While the closet hides them, the dog creates mayhem. Finally, his nose puts him onto them, and he leaps and yaps with excitement. Perhaps, Tiny is right! With order restored and the cats happy with their new friend, we are invited to join the party...only to scare that puppy straight off the page. Will we be able to find him again? insects and a little meat." Who doesn't love a baby? 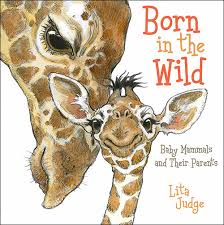 Who could resist that happy, much-loved baby giraffe on the front cover of Lita Judge's newest nonfiction book? Just look at the love in his mama's eyes! There is great diversity in the animals brought to our attention. Ms. Judge uses soft lines and a welcome degree of gentle humor to invite readers to learn about their lives in the wild, the care given and the love bestowed on each one. The short sections begin with a single sentence, meant to bring attention to the needs that all babies have. The informational text does not overwhelm and is carefully placed beside the endearing, realistic images. "A mother chimpanzee holds her infant constantly during its first five to six months of life. Later the youngster clings to her stomach and back. Young chimpanzees play, climb, and wrestle, and learn to build nests and groom one another. They also learn how to use tools like sticks to fish for termites. Females help one another with babysitting. They young aren't weaned until four to six years of age. They live in forested zones in west and central Africa." Also included are a glossary, a list of sources and good websites that have information on animals. Warm and celebratory, this is a book not to be missed! "Sherman saw that Isabel was still right behind him. He gave it all he had. When he reached the tree, he was running so fast, he ran a whole extra mile before he could stop. Finally, Isabel caught up. "Did you let me win?" asked Sherman. "I did at first," she said. "But as soon as you thought you could win, you won." 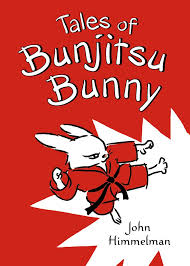 Isabel is a very accomplished young bunny, when it comes to martial arts. That is not all she is good at; in fact, she's very good at using the skills she is learning to make a difference in her world. In a series of short stories that are just perfect for children wanting to read a chapter book, Isabel exhibits her smarts, her courage, her feelings for others to entertain and engage readers. Isabel is a problem solver, in the best sense of the word. The stories presented have just the right amount of text, accompanied by action-filled, expressive images of all of the characters who make Isabel's days so interesting. 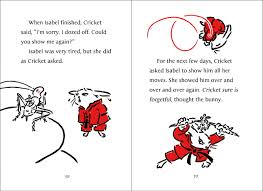 Mr. Himmelman uses black lines to create his characters on a white backdrop, and adds dashes of red for Isabel's Gi and to keep young readers focused on the action contained in each story. Each story has a very quiet ending that leaves us with something to think about before moving on to the next one, or to savor if we quietly consider each one on its own. The fact that the stories concern the martial arts will widen the audience, and the effective storytelling suggests to readers that being smart outweighs being strong, almost every time. "About 2,700 years ago, people in Persia developed sails that they attached to buildings. The wind turned the sails of the windmill, which then turned the grindstones to grind grain. 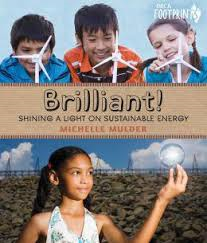 Over a thousand years later, in the fourteenth century, people of the Netherlands used windmills to pump water out of flooded land..."
I know that I have mentioned it before...these are books that should be in classrooms everywhere. They are brilliantly designed and truly informative for children wanting to know more about the footprints we leave in our world. In the Orca Footprints series, Brilliant! follows Down to Earth (2013), Pedal It! (2013), Every Last Drop (2014) and precedes Take Shelter (2014) which I will tell you about in an upcoming post. Brilliant! is meant to inform concerning our need to think hard and creatively about how we are using energy at home and in the greater world. Unless we begin to do that, the Earth of the future will be very different than it is today. Fossil fuels are disappearing and our environment is crumbling around us. If we, as adults, do not express concern and act to make things different, our children will have no one showing them how to do it. "No one knows for sure when our ancestors discovered how to control fire for their own use. Some say it was at least 400,000 years ago. A family would bring fire into a cave and keep it alive for months, or sometimes even years." "The Indian state railway planted millions of jatropha plants along the rails and uses the oil from its seeds to help fuel each train trip. Jatropha can grow in dry places with poor soil, where other plants would never survive, and the seeds are not edible, so it's not like using food for fuel." She goes on to explain the many other ingenious ways that alternative fuel sources are being developed. . Kids will love learning about the soccer ball that 'has a machine inside that captures the movement energy of a rolling ball.' A battery inside is charged and then used to power a lamp! So many inventions on the horizon. For now, we need to be acutely aware of those things we can do to use less fuel. It's up to us! As has been the case with the previous books in this series, the illustrations and clear photographs give essential meaning to the text. The 'Power Lines' and 'Energy Facts' boxes add personal observations and humor, as well as much needed information. Get it for your classroom, your library, or your home to provide food for thought and action! Put on your own thinking cap, and try to visualize new ways to improve life on our planet. to go where he pleases." I love how clearly and wondrously Bob Graham looks at the world. He writes gentle, thoughtful books that have strong appeal for all who share them. The events that concern him may seem unremarkable, until he sets his pen to paper and uses his signature watercolor artwork to make them memorable and satisfying. This one is initially set in India, on a hot and dusty day! A dhaba offers food and beverage, while two young children play hopscotch barefoot and sparrows peck in the dust beside them. One bird proves his bravery and curiosity by landing on a child's finger. The driver of a rice truck stops for lunch, and is not willing to share with the inquisitive bird. Little does he know that his cargo offers an even more tempting snack. When the truck leaves, so does the sparrow. The cargo ship makes its ocean crossing in a series of perfectly paced and framed illustrations, all the way to a bright and exciting city where he finds a wee girl named Edie, and her grandparents. It's a perfect opportunity for another feast...despite a very scary moment! Turns out that the sparrow is not the recipient of this new taste delight! Being young and curious, as the sparrow also is, it is young Edie how discovers a brand new world of taste. Now, get out there and discover your own small and spectacular moments. What might have led to this very moment in time? Can you imagine it? 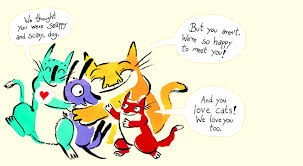 This perfect picture book speaks to those events which connect our world, despite the distances that separate us. My bed is in the middle of the ocean!" It's scary for me to think that parents have 'no time' to read to their children at night. What can they possibly have left to do that they can't take the time to cuddle up, snuggle in and read a story to those amazing children they brought into this world. Imagine the peace and contentment both would feel as sleep settles in, and their time together with a book ends that young child's day! That being said, I do not often pay much attention to a book title that pronounces it is filled with stories that can be read in 'five minutes'. We don't have more than five minutes to spend reading with our kids, showing them how important reading and literacy are to the most special people in their lives? Of course, we do...unless we have fallen into that trap that allows us to think we are always too busy. Luckily, I set aside the tendency to ignore such a book. When I opened the cover and discovered the ten stories that had been collected for bedtime reading, I was delighted to see some familiar favorite titles and that encouraged me to read on and make new discoveries! 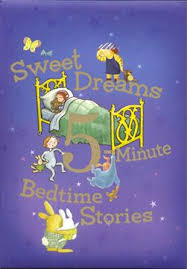 We all know Curious George and the man with the yellow hat; thankfully, George finally succumbs to dreams of the sweet kind in Sweet Dreams, Curious George by Margret and H.A. Rey. You may not know the young boy who finds reading hard, and refuses to read the book no matter what danger might befall him in Cece Meng's I Will Not Read This Book. I know you will be happy to meet both him and his mom. Lucy learns a lesson about how difficult it can be to put a monster to sleep, even one of your own creative imagination in Go To Bed, Monster by Natasha Wing. 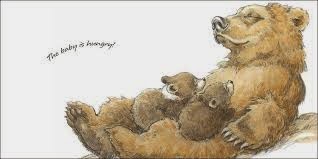 Joanne Ryder's lilting tale of hugs from morning to night ensures sleepy time contentment in Won't You Be My Hugaroo? I can't think of a better way to spend the day and early evening than sharing hugs with those you love! 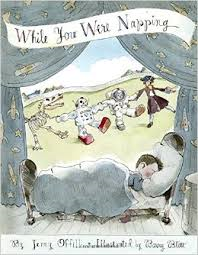 Charlotte Jane Battles Bedtime by Myra Wolfe introduces a young girl with plenty of swashbuckling oomph until a night without sleep (which she sees as the ultimate pleasure) makes scarce that joie de vivre and leaves her in a pickle. In Margot Apple's Blanket, Mom makes the decision that Blanket must be washed. The young narrator is lost and lonely without it. Luckily, her animal friends and the wind rectify the situation. Alice Schertle's Very Hairy Bear uses gorgeous language to take us through the seasons with a bear who has no concern for his 'no-hair nose' until it's time for a long winter's sleep. In The Dream Jar by Lindan Lee Johnson, one sister helps the other learn about changing bad dreams into good ones with imagination, and sometimes with the help of a dream jar. Kerry Arquette takes us on a trip around the animal world to discover, in rhyming text, what each has been doing in her story called What Did You Do Today? She ends with a small child thinking back on his day's doings, too. then run away and hide. To think I might have missed it! In back matter, information is included about each of the authors and illustrators and a bibliography of the books shared in this thoughtful collection. "Here is a girl annoyed by a fat, well-fed, non-store-shopping tree rat chowing down near the backyard fence of her childhood home. When you go four weeks without grocery shopping, you realize how much you took the store for granted." It may feel simple to just go ahead and replace what you would like to eat. Just go to the grocery store. In Mysti's house, it is not at all simple. Life-changing events and secrets must be kept from everyone else. At the moment, they are mostly being kept by Mysti herself. Mysti is another unique and thoroughly likable character. She has a spirited imagination and likes to think of herself living in Paris and enjoying its many wonders, while wandering through its streets on her own...and on her bike! Her real world is much more complicated and scary. In Mysti's world at the moment, she is pretty much on her own to deal with the fallout from her father's hospitalization. He's there because of a fall he took from a tree that ended with his hitting his head on the cement, and suffering a major concussion. The prognosis has improved and doctors are sure he will recover. They do not know when that will happen. "These are the characters in my book. her eyebrow as a hobby. photos of a mysterious walker. The story is forever interesting, often funny, and also painful. With her father unable to provide the support needed, it is up to Mysti to try to keep her mother, her younger sister and the household in check and running efficiently. At school, her best friend has abandoned her in an attempt to become a different person. Her spot at a new lunch table, with all those who don't fit in anywhere else, affords her the chance to meet Rama Khan. Rama is a breath of fresh air and she encourages Mysti to share her very personal story. That story allows a sympathetic awareness of what it is to live a family life determined by the mental illness of her mother. So many things that readers will take for granted do not happen in Mysti's family. As she meets each new obstacle with a maturity beyond her years, she is able to laugh at and share some of the feelings that accompany her struggles to cope. In trying to keep their situation from Rama and from school officials, Mysti learns to meet the needs of family all by herself. She faces it all with bravery and grit, while entertaining us with her strong, believable voice and a quirky sense of humor. And then students wouldn't have to go home early. Making the buses really disorganized. be a long line of jerks with more insults than sense. And insults make you walk away. the sky and begin to lay the ultimate blame heavenward. "Mysti, you are not lost. You are just confused." a scarf, and a hand on her hip. You should get to know Mysti. She is quite special! Wait - hold that pose! Her little brother is intrigued and focused on adding his own special touches to the many perfect pictures Louise has created. 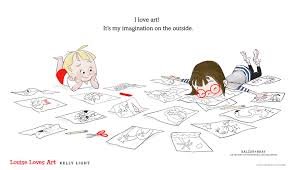 Louise knows that she has a masterpiece inside; all she has to do is keep working until it shows itself. Finally, the image is captured and she is set to prepare for a show! Her brother (aptly named Art) is keen to show his work. Louise is busy! The 'Gallery du Fridge" is just right for displaying her grand achievement! As she works, Art putters and seeks her attention. 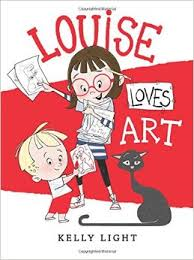 Too late, Louise discovers just what has kept Art busy...art! He wants to be just like his big sister. I love Louise, I love Art and I absolutely love Louise Loves Art! You need to have this book. were the first to come. Oh, my! This is the fun that any older sister should have had at some point in life with a younger brother. I wish I had written it! It had me laughing out loud, and I love doing that! It has nothing to do with being unhappy with that other child who shares your life when you are young. It has much more to do with taking a little revenge. I loved him then, and love him still. I don't remember much of the family tale told of my dumping him out of his carriage when he wouldn't stop crying, and our mom was inside getting food for a picnic. I was only two and a half; I was annoyed. Here I was bouncing the carriage up and down, and still he cried. Fine, I gave him something to cry for, and didn't hurt him one bit. Our mom did find him on the ground next to the carriage. Just one the bumps he swears I inflicted...so untrue! So, when I read this story about a sister who seems primed to assure her brother that he needed sleep more than he needed to partake of all that happened while he was doing so, I couldn't wait to read it myself...and then out loud to others! It is definitely a keeper, and will join Jenny Offill's other books on that special shelf. and took you to your bed. Just a little nap, she said. the giant party that started after she went out." "Luckily, you slept right through it." "I don't know what to believe. On the one hand, he sounds just like my grandfather. I'm half-tempted to see if he has any soy sauce in the pockets of his jacket. On the other hand, I'm not totally sure I believe any of it. Part of me wonders if this is just some weirdo who stole my grandfather's ring and is tricking my mom. She's a sucker for kids with sad stories." What might you do when your grandfather shows up at your house in the body of a 13 year old boy? Ellie's grandfather Melvin does just that! He is, after all, a famous scientist, and he has just discovered the secret of aging. A pretty unique jellyfish is key to that secret. "He doesn't look like the typical theater-crew kid. They usually wear jeans and T-shirts, stuff that's easy to work in. This kid's wearing a rumpled pinstripe shirt, khaki polyester pants, a tweed jacket with patches on the elbows, and leather loafers. But it's his socks that stand out the most: they're black dress socks. You don't see boys in middle school wearing those a lot. It's like he's on his way to a bar mitzvah." He has pointed questions to ask of Ellie; that is when familiarity kicks in. Grandpa turns out to be as grouchy as a seventy-six year old can be! Despite his appearance, his opinions and his mannerisms are the magic that make him funny, warm and too often outspoken. This gets him into trouble attending middle school with his granddaughter. Along the way, he encourages an interest in the scientific world for Ellie, makes readers laugh out loud at some of his antics, and ensures that thought be given to the way in which science has implications (both good and bad) for the world. It is an inspiring read, and a departure from anything that Jennifer Holm has previously written. 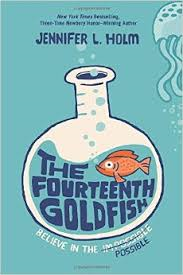 That being said, she handles it with all the aplomb that a gifted writer can bring to this story of family love, aging, death, science, and goldfish. 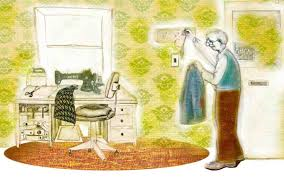 Ellie is a strong and funny voice, Grandpa Melvin is a worthy mentor to his granddaughter (and very funny to readers), their eventual parting is sweet sorrow - yet, endlessly hopeful. "Tears prick my eyes. I don't want him to leave. I grab him, hug him tight. I love you, " I say. ear, "I believe in you, Ellie. You're my possible." around you. Ask questions. Talk to your teachers. 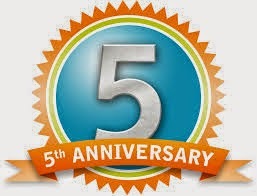 Happy 5th Anniversary to Sal's Fiction Addiction, with thanks to Ingrid and every visitor for the past five years! 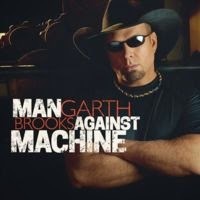 I was so excited about the release of Garth Brooks' new album yesterday; I completely forget that it was a special day for me, too. Thanks to my friend Ingrid, who assured me that I had something to share, I did my first post on November 11, 2009. She was not at school, and I was not at work. Together, we chose a name, set up this blog, and got started! It's been a welcome journey and I continue to love working at it. My goal remains the same - to let you know about SOME of the wonderful books being published for children, adolescents and young adults today! It's tough for an 'old' retired teacher-librarian to keep up with all there is to see. I know how hard it is for teachers, teacher-librarians and parents to be aware of what is out there for the children they love. So, I hope to make selection a tad easier. I cannot tell you how much I appreciate the many visits to the site, the comments left, the encouragement I receive from friends to keep working at it, and the support I get from the publishing world to share their books with you. I feel that I have made new friends - though they be virtual ones - who offer advice, guidance and encouragement for this work. "It would need to be stylish. You are likely to admire Mr. Frank from the moment you meet him! 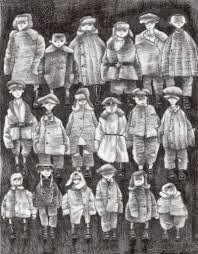 He is a tailor, who has been doing the work he loves since he was very young. As he nears the end of his career, one order brings his love of the job full circle...he has never been so excited about a project. As he contemplates the work, he thinks back on his many years and the many tasks he has tackled...army uniforms, suits, dresses and skirts, a wide collection of hip outfits, jeans and tutus. It's been a worthwhile way of living for sixty years! The design was so simple it was elegant. a thousand times - plus one." Do you want to know what the special project looks like? Get out there and find a copy of this lovely homage to a father, and grandfather. It is very special. But, wrinkled or not, it is food. From her platform perch, she is able to remain close enough to quietly watch the wildlife...the fox and a bear and its mother in September, a skunk family, woodpeckers, and rabbits in October. Then November arrives, and her days are spent watching and drawing a lynx, some chipmunks, a mother doe and her two fawns. Canada geese rise into the air and fly off to warmer climes, entertaining with their loud song. "We can learn from animals, my father says. About patience. About truth. About quiet. we are just its keepers." Ready or not, here comes winter. This would be a winning way to celebrate its arrival. Once again, I am floored by the extraordinary illustrations created by Jim LaMarche using acrylics, colored pencils and opaque inks. His richly colored landscapes make the coming of winter bearable, enticing readers to make the outdoors a place for exploration and discovery. His amazing use of light and his changing perspectives are trademarks of the work he does. The focus for each spread is the young girl and her tree perch. If you have a naturalist on your Christmas list, this book would be a perfect gift! You never know what might happen when Mom announces that her sons have a surprise in store for them when the family gathers later for dinner! What might it be? There is no end to the guessing that goes into trying to determine what their mum has in mind. Younger brother Leo is hoping for 'crinkly chips.' His older brother thinks back on other surprises, and manages to negate many of his own ideas. 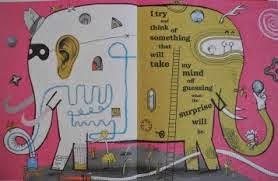 It could be a new car, a swimming pool, a lift in their apartment building, a room of his own...the mind is full of possibilities! Leo has all the information from a brochure he's reading in the doctor's office. Off they go, imagining a trip won in a competition. It doesn't take long for word to get out; a secret told is a secret shared. Everyone on the school bus hears before the bus stops. Soon, the teacher knows and then the Head Teacher...it's a celebration for all! Home they go...all anticipatory glee at knowing that the surprise has been guessed! They can't wait to tell their mum. She's in for a stunner....or, is she? Turns out, after removing himself to his bedroom to pout, Leo has orchestrated a 'different surprise.' Huzzah! 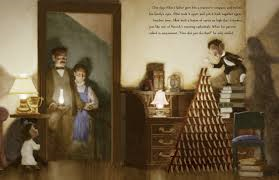 David Mackintosh's uses mixed media, and abundant ideas, to tell this family story that is full of laughter and love. There is so much to see in the detail-loaded illustrations. You are sure to pore over them again and again as you share this story with your kids. Aren't they LUCKY?